Using the Domain Information Groper (dig) command line tool, you can test against the delegation where your domain is hosted, and you will immediately see whether the change took place without accounting for the cache or TTL (Time to Live) that you have configured. Windows users can download the tool from BIND’s website. Use Terminal to access dig on Linux and Macintosh systems. Before using BIND's dig tool, you must access or install dig on your system. Once you have access to dig, you can use dig to test your DNS. From your Applications folder, open the Utilities folder, and then select Terminal. When Terminal is open, type a dig command using a hostname you want to look up. Go to BIND’s website and download the most current, stable version of BIND. BIND supports both 32 and 64 bit Windows systems. Confirm which version of Windows you are using and download the correct version of BIND. View Microsoft’s documentation to determine which version of Windows you are using. Extract the downloaded file and install BIND in the following directory: C:\Program Files\ISC BIND 9. Select the Tools Only check box. Once BIND is installed, on the Windows menu open the Control Panel, and then open your System properties. At the end of the path in the Edit System Variable window, add C:\Program Files\ISC BIND 9\bin, and then click OK. In the Edit Variables window, click OK. In the System properties window, click OK.
Click the Windows menu icon. Enter CMD, and then click OK.
Open Terminal (Mac and Linux) or Command Prompt (Windows). Type dig <any hostname>, and then press Enter. Question section: The query made to the DNS. 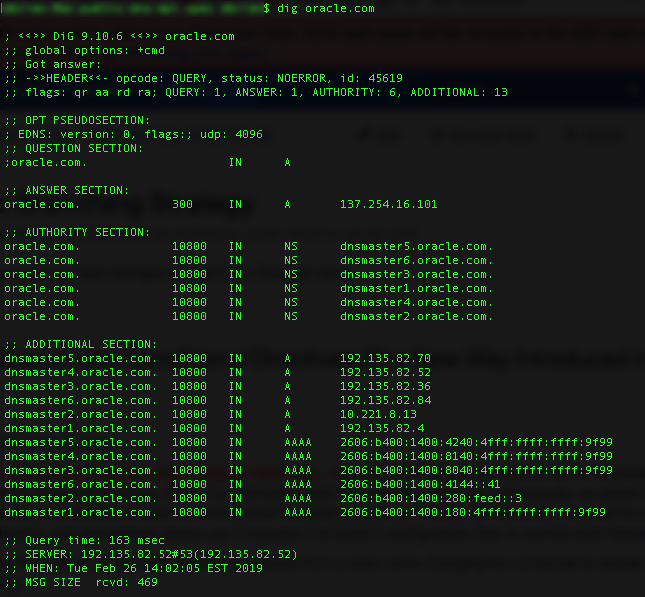 In this example, we asked for the first available A record for the hostname, oracle.com. Answer section: The first available answer for the query made to the DNS. In this example, we received the A record for the IP address 137.254.16.101. Authority section: The authoritative nameservers from which the answer to the query was received. These nameservers house the zones for a domain. Additional section: Additional information the resolver may need but not the answer to the query.